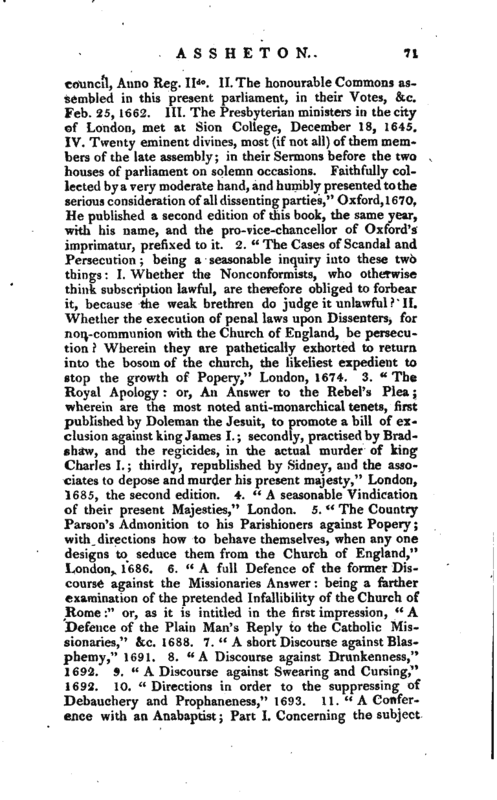 , son of Mr. Assheton, rector of Middleton in Lancashire, was born in 1641 and being instructed in grammar-learning at a private country-school, was removed to Brazen-Nose college at Oxford, in 1658 and elected a fellow in 1663. 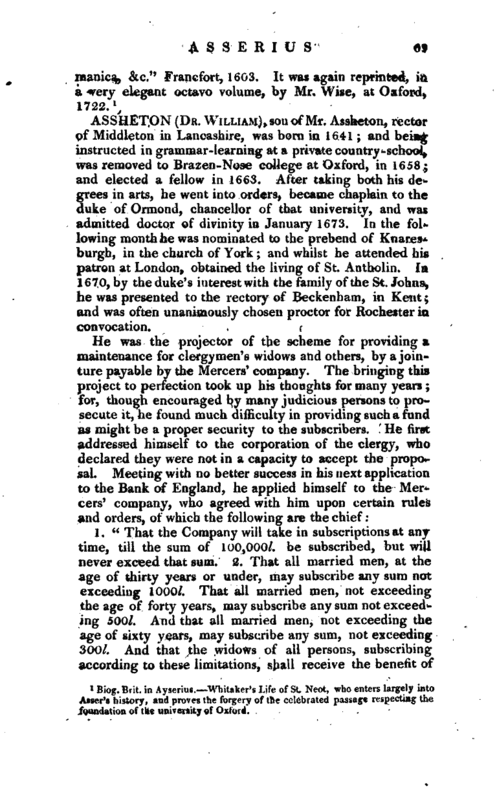 After taking both his degrees in arts, he went into orders, became chaplain to the duke of Ormond, chancellor of that university, and was admitted doctor of divinity in January 1673. In the following month he was nominated to the prebend of Knaresburgh, in the church of York and whilst he attended his patron at London, obtained the living of St. Antholin. 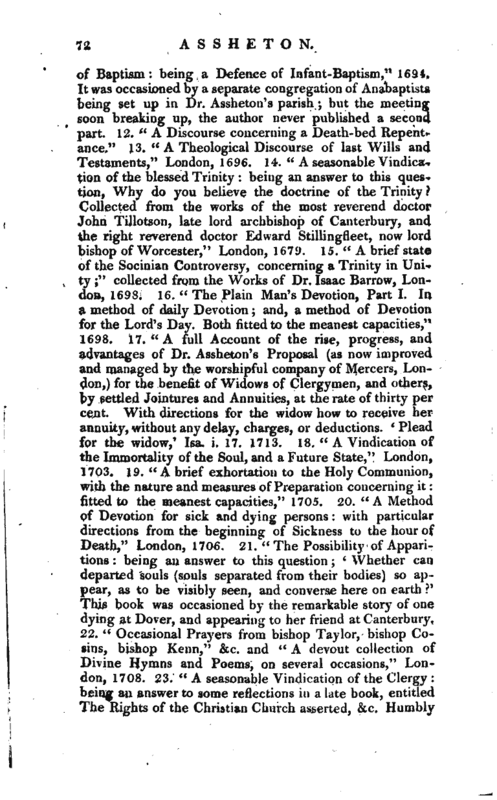 In 1670, by the duke’s interest with the family of the St. Johns, he was presented to the rectory of Beckenbam, in Kent and was often unanimously chosen proctor for Rochester in convocation. 1, “That the Company will take in subscriptions at any time, till the sum of 100,000l. be subscribed, but will never exceed that sum, 2. That all married men, at the age of thirty years or under, may subscribe any sum not exceeding 1000l. That all married men, not exceeding the age of forty years, may subscribe any sum” not exceeding 500l. And that all married men, not exceeding the age of sixty years, may subscribe any sum, not exceeding 300l. And that the widows of all persons, subscribing according to these limitations, shall receive the benefit of | 30 per cent, per annum, according to the former proposal^ free of all taxes and charges, at the two usual feasts of the Annunciation of the Blessed Virgin Mary, and St. Michael the Archangel and that the first of these payments shall be made at the first of the said feast days, which shall happen four months or more after the decease of the person or persons so subscribing excepting such as shall voluntarily make away with themselves, or by any act of theirs occasion their own death either by duelling or committing any crime, whereby they shall be sentenced, and put to death by justice in any, or either of these cases, the widows to receive no annuity; but, upon delivering up the company’s bond, to have the subscription money paid to them. 3. 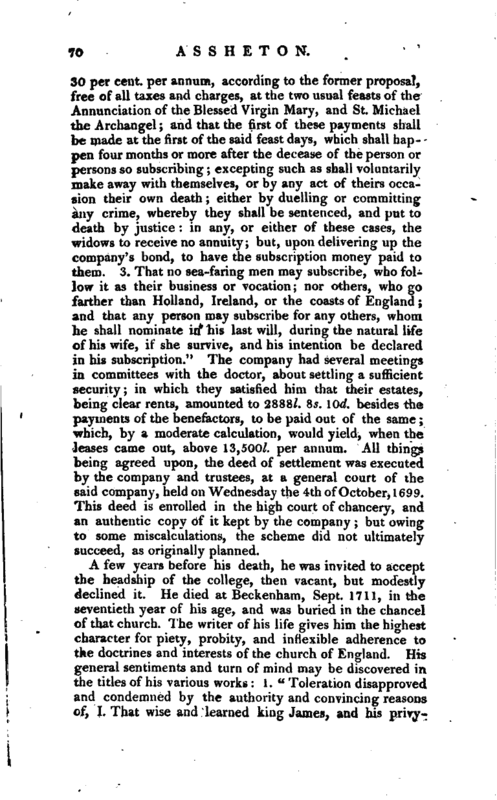 That no seafaring men may subscribe, who follow it as their business or vocation; nor others, who go farther than Holland, Ireland, or the coasts of England and that any person may subscribe for any others, whom he shall nominate in his last will, during the natural life of his wife, if she survive, and his intention be declared in his subscription." The company had several meetings in committees with the doctor, about settling a sufficient security in which they satisfied him that their estates, being clear rents, amounted to 2888l. Ss. lOd. besides the payments of the benefactors, to be paid out of the same which, by a moderate calculation, would yield, when the leases came out, above 13,500l. per annum. All things being agreed upon, the deed of settlement was executed by the company and trustees, at a general court of the said company, held on Wednesday the 4th of October, 1699. This deed is enrolled in the high court of chancery, and an authentic copy of it kept by the company but owing to some miscalculations, the scheme did not ultimately succeed, as originally planned. 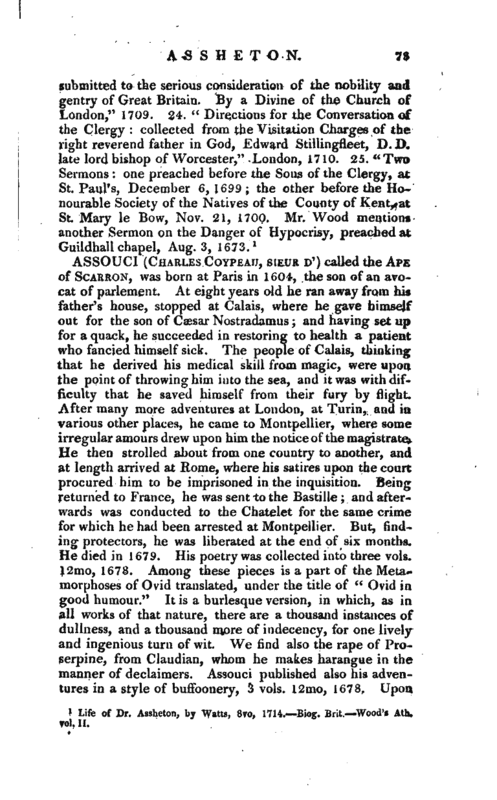 Life of Dr. Assheton, by Watts, 8vo. 1711.—Biog. Brit.—Wood’s Ath. vol. II.